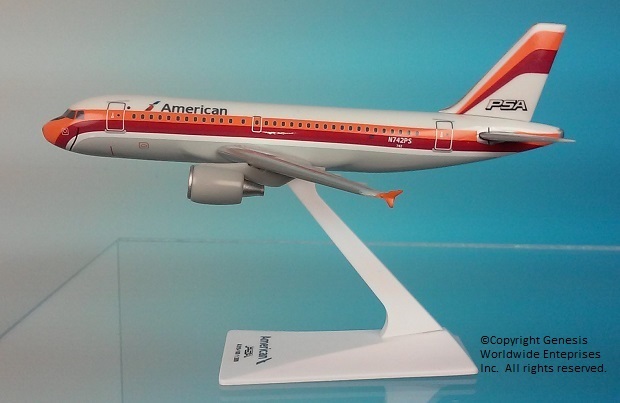 Flight Miniatures 1:200 Scale Plastic Snap-Fit – Airbus A319 – Length:6.625" Wingspan: 6.75"
In September 2014, American Airlines honored its second heritage livery, Pacific Southwest Airlines. This model represents this aircraft, painted in the 1969 PSA livery on Airbus 319-100 and bearing registration number N742PS. Pacific Southwest Airlines (PSA) was a United States airline headquartered in California, that operated from 1949 to 1988. It was the first large discount airline in the United States. PSA called itself "The World's Friendliest Airline" and painted a smile on the nose of its airplanes, the PSA Grinningbirds. PSA was one of the four airlines that formed US Airways, the others being America West Airlines, Piedmont Airlines and Allegheny Airlines. PSA was merged into USAir in 1988. USAir then changed its name to US Airways which in turn merged with American Airlines in 2013. As part of the heritage livery celebration, premium cabin passengers traveling in select markets received one of nine commemorative retro-themed amenity kits through January 2016.